(NaturalNews) Quackity quack, the quacks are back, and this time they're targeting fish oil supplements, claiming that taking fish oils raises your risk of prostate cancer. Hogwash. This is just another case of pure fearmongering quackery by the anti-vitamin crowd. Remember: All these people attacking vitamins are the very same people who are on the take from Big Pharma. Remember, too, that companies like GlaxoSmithKline (GSK) have already been convicted of multiple felony crimes by the U.S. Department of Justice. And today in China, GSK was caught yet again engaging in widespread bribery and criminal fraud. Do you honestly think these companies wouldn't fake a bunch of studies (and pay off a bunch of researchers) in order to try to discredit vitamins, superfoods and fish oils? I've seen this numerous times, with vitamin studies being done on people who are in critical care situations with heart attacks, for example. On their death beds, they're given things like vitamin E, so that when an alarmingly high percentage of them die, the quacksters can blame the vitamins! If you really dig deep into many of these fearmongering studies that try to discredit vitamins, you'll find they were conducted on people who were already about to croak. 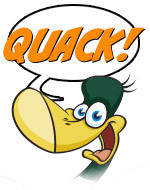 ...or quack. Here's another favorite tactic: Instead of using high-quality fish oils or vitamin E, researchers source the most low-grade, synthetic chemical crap they can find. Then they call it vitamin E, or fish oils, or whatever they want. It turns out there are no rules whatsoever regarding the vitamin labels researchers can use to describe substances. They can literally take human sewage sludge, dry it into a powder, encapsulate it into a pill, then call it a "vitamin B-12 supplement." And then -- OMG! 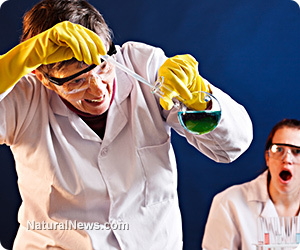 -- vitamin B-12 has been "scientifically" found to make people sick! See how easy it is? When real vitamins are used for these studies (which is rare), they tend to make people experience improved health outcomes. So what quack researchers do to make sure their study results look really scary is to kick all the healthy people out of the study, thereby "shaping the data" into whatever results they want. How do you kick healthy people out of a study? You simply find their record in the study spreadsheet or database and then hit delete. It's that simple. And it happens every day in the quacked-up, fraud-infested "science" being paid for by Big Pharma in order to try to discredit vitamins (and thereby make people default to prescription medications instead). Why bother even recruiting people into a study? As Big Pharma researchers have already been caught doing over and over again, all you really have to do is fabricate the entire study by inventing all the data. Take the case of Dr. Scott Reuben as a prime example. This "superstar" Big Pharma researcher took a bundle of money from Pfizer and other drug companies ($420,000 in all), then proceeded to fabricate dozens of studies which were then published in "peer-reviewed" medical journals. The Wall Street Journal even reported on all this, along with hundreds of other media outlets. Dr. Reuben was ultimately found to have been faking pro-pharma research data for 13 years. Quackity quack! And he's not alone. In fact, the faking of research to discredit vitamins while downplaying the serious health risks of pharmaceuticals is routine across the industry. Here's another popular ploy used by researchers to discredit vitamins: In addition to giving study subjects a vitamin pill, also give 'em something really toxic such as a statin drug. But don't mention the statin drug in the study; just focus on how many people were "harmed by the vitamin." Sure, the subjects got sick, but no one is ever told the real reason why. Are there researchers who will LIE like this in "scientific" studies? Umm... do politicians break campaign promises? Of course they do. Anything to get money or power. Heavy metals like arsenic can also be readily found in some low-grade, cheap sources of nutritional supplements (often made by drug companies, it turns out). For example, cheap sources of calcium are often contaminated with lead. Cheap sources of seaweeds are often contaminated with arsenic. Cadmium is also easy to find in certain low-grade supplements. Somehow, apparently as if by magic, researchers always manage to find the most heavily-contaminated made-in-China supplements to use in their quack smear studies (which are really engineered smear campaigns). Notice, by the way, that they never disclose the actual metals content of their supplements. Rarely do they ever disclose the country of origin, either. That's because they're sourcing these "poison pills" from China, and actually searching for the most toxic pills they can find. Many studies that are claimed to be "double-blind" really aren't. The researchers secretly know exactly which study subjects are receiving the pills vs. placebo. And in the case of these vitamin researchers -- who actually set out from the start to discredit vitamins and fish oils -- they can then proceed to influence the results by playing mind games with the patients. For example, they can tell the people who receive placebo that they're actually receiving "the good stuff" and should expect to get better. Their minds make it real, and they get better, thereby discrediting the vitamin itself which looks overshadowed by placebo. Or they can tell the people receiving the vitamin that they are actually "receiving a placebo," so they shouldn't expect to get any better. Their minds make it real, downplaying the biochemical benefits of the vitamin, thereby making the vitamin look useless. They use the same mind games all the time to show positive results from prescription medications. In fact, the placebo effect is the only thing really going for many prescription drugs such as antidepressants. Here's how the recent study bashing fish oils was probably pulled off: the fish oil CAPSULE can be specially formulated to contain highly-toxic hormone-disrupting cancer-causing chemicals such as BPA. You can actually formulate fish oil capsules to contain "plasticizers" by sourcing them from a factory in China. They will be glad to manufacture fish oil capsules with 10,000 times more BPA than they might normally have, thereby slamming the prostate gland with a cancer-causing, tumor-growing hormone chemical that's well known to cause cancer. This will never be detected because nobody working at the medical journals (nor in the mainstream media) actually conducts any quality control tests on the substances used in the study. They just assume the researchers are acting with integrity... and that's often not the case. Formulating fish oil pills to cause cancer is a no-brainer, especially if you've got financial connections to the same global drug cartels that are running bribery schemes in countries like China -- and this was just confirmed yet again by the Chinese Government.